We exclusively use the superb carbon-composite propellers made to our design by Helix Carbon GmbH in Germany. These top quality propellers are a 2 piece 1.30m, 2 blade design that slide together to produce an ultra-strong and lightweight set-up that can be easily stowed in the their supplied Bailey Aviation covers. 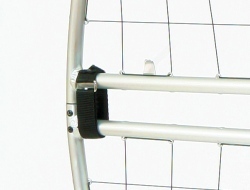 There are two different propeller mounting systems offered. 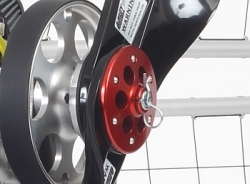 The standard set-up has a six point fixing, featuring M8 studs that the propeller fits over, sandwiched either side by neoprene gaskets, with a red anodised clamp plate that fits on last and then secured with anti-vibration Nyloc nuts. 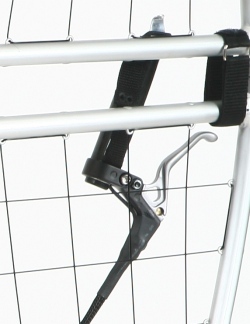 The optional mounting method is the Bailey Quick Release Propshaft (BQRP), which utilizes six 8mm dowel pins instead of threaded studs, so the propeller fits over the six dowel pins, again sandwiched by neoprene gaskets and then the quick release plate fits on last and a single bolt fixing secured with an 'R' clip enables fast and easy propeller removal and more evenly distributed clamping pressure. The Bailey Quick Release Propshaft (BQRP) is a very popular option and is supplied with its own bespoke prop bolt fastening spanner. The V5 uses a new bespoke harness designed in collaboration between Bailey Aviation and Sup’Air of France. 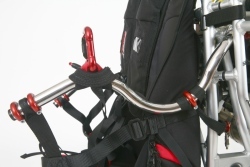 This lightweight harness is rigid but comfortable and has lots of useful features, such as: Double lock Sup’Air caribiners, in flight accessible 6x9” pockets, quick release buckles, speed bar pulleys, adjustable leg support, secondary safety hang straps, rucksack type ground hang system and padded shoulder straps. 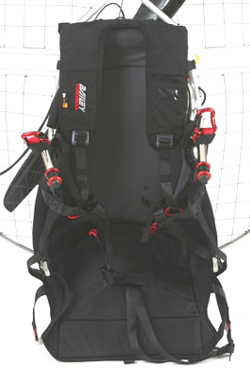 The harness also has integral reserve bridle routing underneath Velcro padding – Perfect for fitting a Sup’Air reserve. 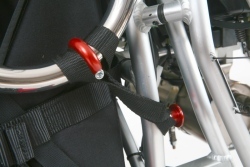 The harness is fitted to the chasiss with stainless steel quick release securing pins at the top and webbing loop straps that fit over red anodised bosses at the bottom. 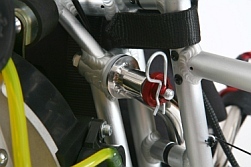 Our harnesses are also fitted with a clear plastic window on the left hand shoulder strap, designed to accept the optional PET2000DXR tachometer/hourmeter. 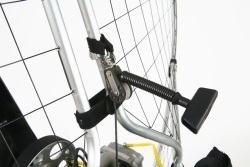 The harness has plenty of adjustment range and is available in either medium or large sizes. We find that most pilots are suited to the medium harness, but it may be necessary to use the large harness if you are over 6' 3" or 100Kg. The V5 comes as standard with our new 11.5 litre plastic fuel tank, with site level gauge/scale and two quick release dry-break fuel couplings. 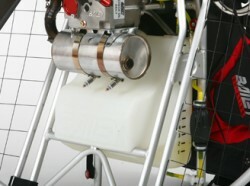 The new plastic tank is lighter than our previous alloy versions, fuel level can be easily seen and for the competition minded is is also mounted higher on the chassis and provides a clear air flow path under the seat and onto the prop arc. Overal CofG is also higher giving a lighter feel to the machine. The new plastic tank is a quick release design that comes with a shoulder strap for those long walks to find fuel on bivouac trips. The V5 throttle has a lightweight alloy core, with black silicone anti-slip handgrip and ergonomically designed alloy lever with an integral adjustable webbing strap. The throttle cable itself is housed in a hard wearing textile braided covering that is heat shrunk to keep it fully sealed. A recessed high quality stop button is fitted to all V5 models. 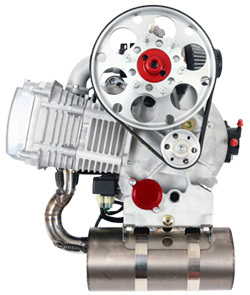 The throttle itself can be adapted from right to left handed use with no tools required in a matter of seconds. 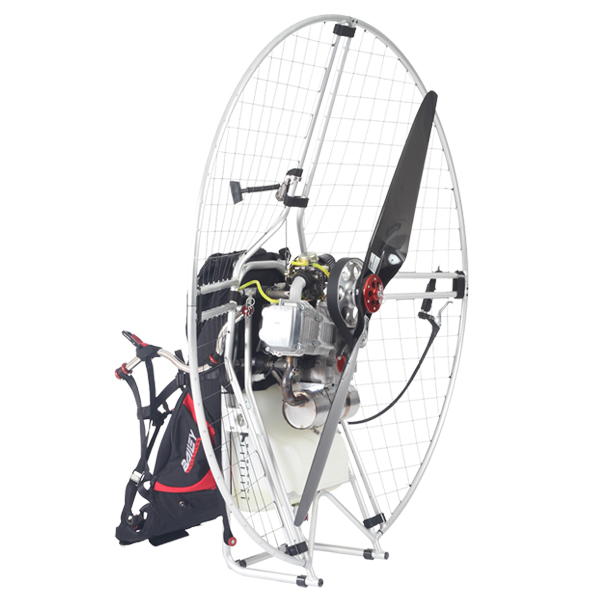 Technical information for Bailey V5 paramotor, manual start, 1.30m propeller. All prices include 20% UK VAT.